Vita Coconut Water is a popular healthy drink, available for home delivery, office delivery or for on-premise establishments such as hotels and restaurants from Aqua Amore. We’re proud to have had the Vita Coco Coconut Water range on our portfolio of soft drinks and waters since 2009. Aqua Amore are happy to present Vita Coco Coconut Milk with almond 6x1L, a convenient pack-size for use in the home or office, delivered by our very own delivery drivers! AS GOOD AS THE REAL THING – With a rich, smooth texture, our Coconut Milk is the only non-dairy milk with a comparable creamy taste experience to dairy milk (don’t worry, it’s nothing like the watery almond milks you’ve tried!) This makes it perfect as a creamer in coffee, a nutrient boost in your smoothies, a base in overnight oats, or just poured over your favorite morning breakfast cereal. 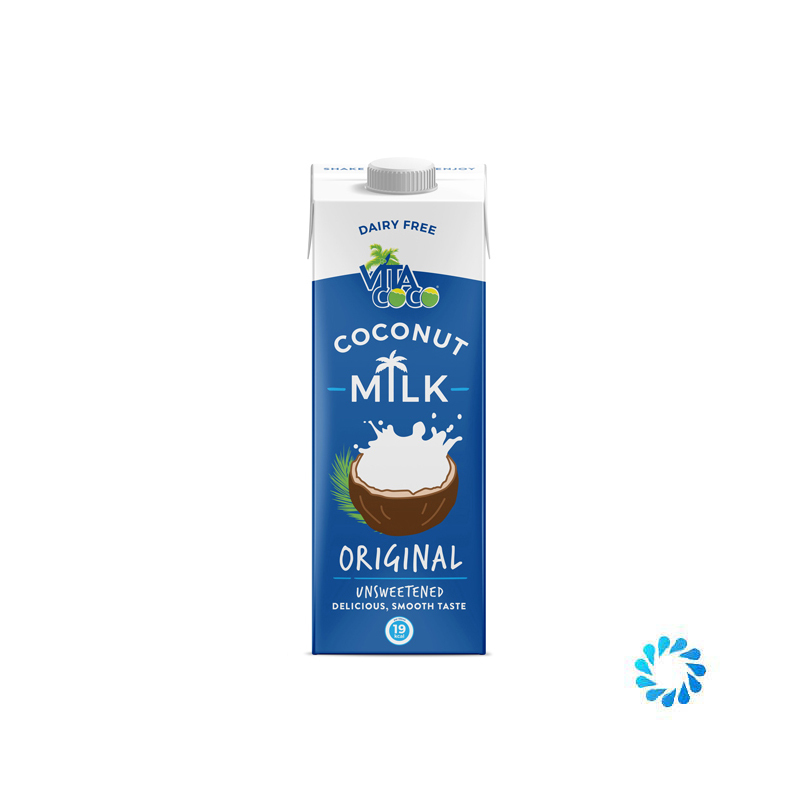 50% MORE CALCIUM THAN DAIRY MILK – Our Coconut Milk is dairy free milk as it should be. Our original, unsweetened Coconut Milk has 50% more calcium than dairy milk. Plus, since we use coconut water as a base, you get the added boost of naturally occurring electrolytes and vital nutrients in every sip. NO ADDED SUGAR, NO FUNNY BUSINESS – Our Coconut Milk Original is unsweetened, carrageenan free, gluten free, dairy free, soy free, preservative free, artificial coloring free, almond free, oat free, macadamia free, hemp free, with no artificial vanilla or chocolate flavoring… now that’s a lot of “free”dom! Our Coconut Milk is delicious and great for those looking for a dairy alternative that is vegan, Non-GMO certified, and tastes smooth as silk! PLANT-BASED GOODNESS OF COCONUTS – Coconuts are naturally full of goodness, so we use a simple blend of coconut water and coconut cream to help make our delicious Coconut Milk. Our coconuts are hand-picked on thousands of small farms and our factories use every part of the coconut! SHELF-STABLE TETRA PACK PACKAGING SO YOU CAN STOCK UP – Perfect for stocking up in your pantry so you can always have great tasting, dairy free milk on hand. No need to worry about buying a gallon of skim milk because our eco-friendly Tetra Pak packaging helps protect our rich, smooth taste. For prime results, refrigerate before opening and enjoy!